When I was a kid my mom never bought good cereal. We never had Captain Crunch, Fruity Pebbles, Count Chocula , Fruit Loops or Lucky Charms. Instead my mom made huge batches of healthy granola chock full of nuts and dried fruit. I did managed to tried all the above at someone elses house, or even trade a handmade baked good for a individual size box of Sugar Pops (my fav) that you could make a bowl out of the box and pour the milk right into the wax lining. And while they were tasty, once I had my own money and was buying groceries, the hefty price never seemed worth it. Fast forward 40 years and I am my mother except I dont handmake copious amounts of granola, that would seem silly given all the handmade granola options at the store. I do stick to the healthy or boring cereal for my family, Raisin Brand, Cherrios (plain), Special K and Rice Krispies. Much to my kids disappointment I wont buy them crappy sugar laden cereal either. Although, they are a resourceful bunch and are able replicate any chocolate cereal by floating the boring cereal in chocolate milk. 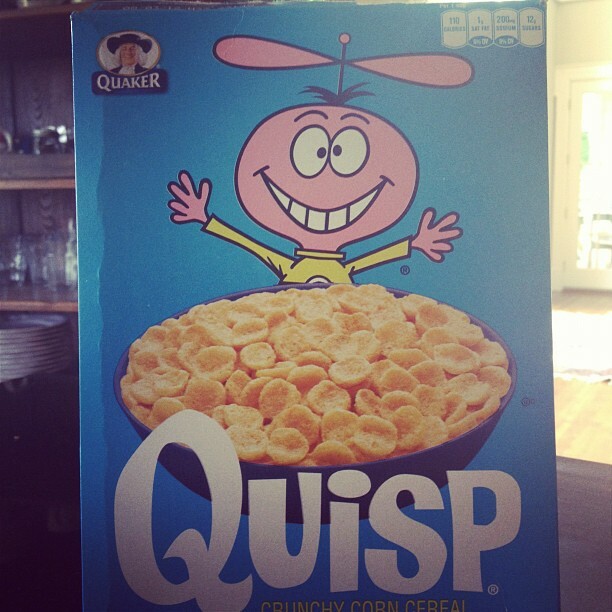 I did given in recently however when I saw this box of Quisp of cereal in our local grocery. I loved the retro box and the non-sensical comic on the back for a little light reading with breakfast. I also appreciated it didn’t even try to claim to be full of vitamins and minerals making it an integral part of my daily nutrition but it would give me “energy”. It was unapologetically full of sugar. I did have a bite, and am afraid my adult taste buds couldn’t appreciate its simple goodness. I bought two boxes. They didnt last long with my 4 kids (the 14 and 16 could have eaten an entire box, no probs). They thought it was yummy and that these commercials were HIGHlarious.